As Chief Operating Officer of Evergreen, Seana Irvine oversees Evergreen's staff and volunteers, organization-wide operational planning, as well as risk-management planning, policies and procedures. A key member of the organization since 1997, Seana facilitates the development and implementation of Evergreen's strategic plans and opportunities, and she has led the millennial-phase growth of Evergreen's national programs and the design of community programs at Evergreen Brick Works. On Monday, July 8 around 5pm, just in time for rush hour, Mother Nature opened up her skies and hit the Greater Toronto Area with a deluge of rain. In some places, almost 130 mm of rain fell in just a matter of hours—a downpour that broke the previous record for rainfall that was set during 1954’s Hurricane Hazel. The intensity and volume of Monday’s storm left many parts of the City without power, flooding thousands of basements, closing down TTC stations and stranding motorists and train passengers for hours—literally in their tracks. While talking about the weather is a Canadian pastime, the increasingly erratic and severe weather is beginning to silence even the most strident climate change denier. But one thing is for sure: our aging urban infrastructure is ill-equipped to deal with our changing climate. At Evergreen Brick Works, we are actively working to advance greener approaches to city infrastructure; promoting innovations for replacing aging and unsustainable infrastructure with new systems that will not only be more resilient in the face of extreme weather, but will also prevent the worst effects of climate change by reducing our carbon footprint. This facility is about more than demonstrating cutting-edge green design; it’s also a hub that connects theory with action, a living laboratory where leading innovators and the public can come up with solutions together. In developing this site, we employed the highest standards of green design, but we also recognized the need to develop our own adaptive strategy to withstand severe weather events—especially flooding. Given our location in the floodplain of the Lower Don River, we knew the site would need to absorb water on a regular basis, and that we would have to devise clean, effective ways to divert excess water when flooding inevitably occurs—both rainwater runoff and messy, silty water from the Don River’s overflowing banks. In developing these green design features, we took our cues from the natural systems and cycles that have been defining our local landscape for millennia and well before human settlement. Greenways set between the site’s buildings have been planted with grasses and shrubs that slow rainwater down, trap sediment and release oxygen. Lined with a geotextile material, the greenways prevent rainwater from seeping into and contaminating ground water. They remain dry for a good portion of the year but can accommodate large and sudden storms. The greenways clean the water and channel it into the stormwater management pond, located at the southern edge of the site, which also collects water from the parking lots and other hard surfaces on site, filtering sediment within the water before it is released back into the Don River. The site’s eastern parking lot features pervious concrete, which contains less sand and up to 25 percent more air than normal mixtures, making it more porous for absorbing rainwater and recharging the water table. Rainwater percolates through and into the soil, where it is naturally filtered and helps replenish the groundwater supply. In heavy rains, excess runoff is channeled via the greenway and into the stormwater management pond. We also minimize the amount of runoff from the buildings’ rooftops by collecting rainwater in fifteen 20,000-litre cisterns, situated strategically around the site, which keep water stored for other uses, such as gardening and in the site’s toilets. For more details about flood mitigation, see the Green Design pages on our website. 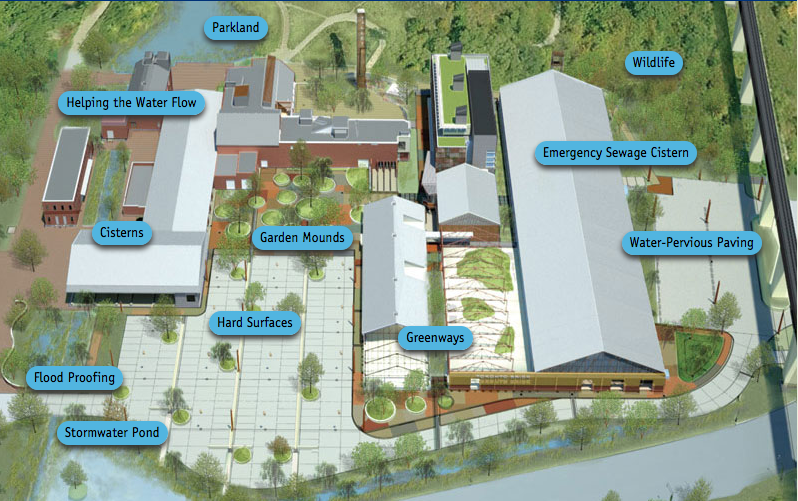 In addition to the site’s physical design, Evergreen Brick Works has detailed flood management and evacuation protocols, which serve to protect all visitors, staff and volunteers whenever flooding occurs. In our latest flood, all systems worked as designed and we were able to learn much from our response plans. Although we experienced extensive flooding—in some places more than a metre of water—no serious structural damage or personal injury occurred. We are grateful to all those who helped with the clean-up and to everyone for their patience while we dry out. Thanks to quick action, all of our programs and partner events were up again in 24 hours. With this flood following only 45 days after our last major flood, it was a difficult pill to swallow. However, as we all grapple with how to adapt to increasing unstable weather patterns, it may be best to understand such instances as the new normal…and be ready.